The Homebase clearance has just had lots of new bargains added once again, and if you're after more storage for the kids they have loads on offer, with prices now from just £1.50! The cheapest items for kids are these Strata 24 Litre Curve Boxes* in either blue or pink, now priced at just £1.50 each. Although they don't come with lids they're a really low price for something so big, and they should stash away lots of toys easily. My favourite are these Animal Storage Cubes* that are now just £3 each, and they look great for younger children with their fun, bright designs. You can choose from a frog, monkey, hippo or a grinning shark, with their open mouths acting as a 'window' so you can see what's inside the box. 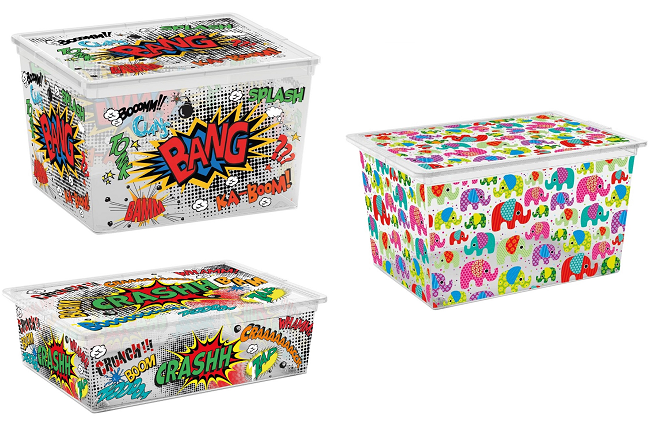 TheseComic Patterned Boxes* are also great fun, and at £5 each they're a good price too, or for younger ones how about thisElephant Patterned 27L Cube*, again for just £5. As all these are clearance items stocks on some items are limited, and not all are available for home delivery though all are okay for click and collect subject to stock levels in your local stores. Click and collect is free of charge. Home delivery charges are from £3.95. , Elliott would love these! These are adorable! And not bad for £3! !